On November 9th and 10th 1938 the first act of the Holocaust was carried out. Across Germany and Austria over 1,200 synagogues were desecrated while thousands of Jewish businesses were attacked and looted, 90 people were killed and over 25,000 Jewish men were deported to concentration camps at Dachau, Buchenwald and Sachsenhausen (where hundreds died). The Jewish Central Information Office, later re-named The Wiener Library, immediately compiled eye-witness testimonies of the events: from face to face and telephone interviews, letters, written reports and newspaper articles. Some are raw and angry, some beg for help, others are defiant; their voices vividly bring to life the destruction that followed. Accompanied by material from the Library’s collection that sets the events in a historical and international context, as well as a detailed glossary. 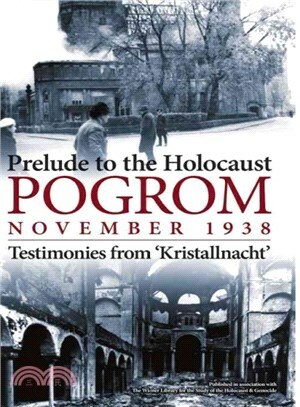 Produced by the The Wiener Library for the Study of the Holocaust & Genocide, the world’s leading, and oldest, archive of material related to the Holocaust and the Nazi era. Founded in 1933 the Library has a unique collection of over one million items, a living memorial to the victims of the Holocaust.